Release Date: April 28th, 2006 by Lionsgate Films. The Cast: Laurence Fishburne, Keke Palmer, Angela Bassett, Curtis Armstrong, Tzi Ma, Lee Thompson Young, J.R. Villareal, Sean Michael Afable. 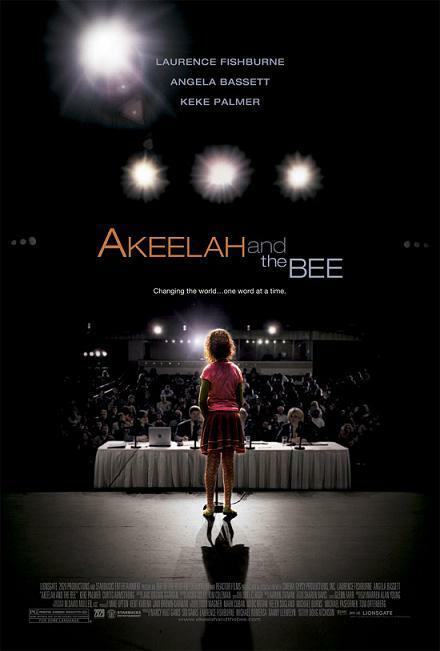 BASIC PREMISE: Akeelah (Palmer), an 11-year-old from south Los Angeles, tries out for the Scripps National Spelling Bee with Dr.Larabee (Fishburne) as her coach. ENTERTAINMENT VALUE: Sometimes, a film can be predictable and formulaic, but still be engaging and full of small surprises just like in this case. Keke Palmer gives an amazing performance as Akeelah, a young girl who doesn’t do well in middle school but excels in spelling words. Her mother (Bassett) doesn’t support her love of spelling—she calls it a “hobby” that just gets in the way of her school work. A school teacher as well as the principal (Armstrong) encourages Akeelah to join the school’s spelling bee competition, where Dr.Larabee, a spelling coach, watches from the crowd. Of course, he chooses Akeelah as his protégée. With rigorous training, which includes a jump-rope, he pushes Akeelah to want to win. Her only real friend a fellow contestant named Javier (Villareal). Dylan (Afable), last year’s champion, also joins the competition with the help of his strict, arrogant father. Akeelah is not just a cute little girl with a dream—she has issues to deal with including the recent death of her father. Likewise, Dr.Larabee also comes across as a complex character that has much more to him than meets the eye—although, why do wise characters tend to have beards (i.e. Robin Williams in Good Will Hunting)? Most of the film seems a bit manipulative, but, truthfully, most films are manipulative in some way and still are entertaining—what’s wrong with that? In the riveting third act, the basic questions include: Will Akeelah beat the odds and win the Scripps National Spelling Bee? Will her mother be there to support her? Writer/director Doug Atchison makes you care about the answers to these questions because you actually care about Akeelah and want her win as much as her coach wants her too as well. SPIRITUAL VALUE: The way that Akeelah and Dr.Larabee emotionally connect later in the second act is powerfully moving. They both bring a lot of baggage, so-to-speak, to the spelling competitions, but with the right balance of courage, passion and maturity, anything can be accomplished. The deeply satisfying, uplifting ending will put a big smile on your face. IN A NUTSHELL: A real winner! Enormously entertaining! Beautifully written, deeply moving and uplifting! A true crowd-pleaser! Keke Palmer gives a breakthrough performance!